This week's Sepia Saturday photo of a group of intrepid adventurers posing at the entrance to a limestone cave system in New South Wales gives me an opportunity to make a return visit to Dovedale in the English Peak District, which I have featured a couple of years ago: Donkey Rides at Dovedale and The Compleat Angler, a Derbyshire Fishing Trip. This time I can use a couple of more recent acquisitions, purchased for very modest sums on eBay. The first, a large envelope made of green paper with a shiny, faux crocodile skin finish and gold print, contains 32 black-and-white and blue-tinted lithographic prints, each measuring approximately 205 x 151mm (8" x 6"). 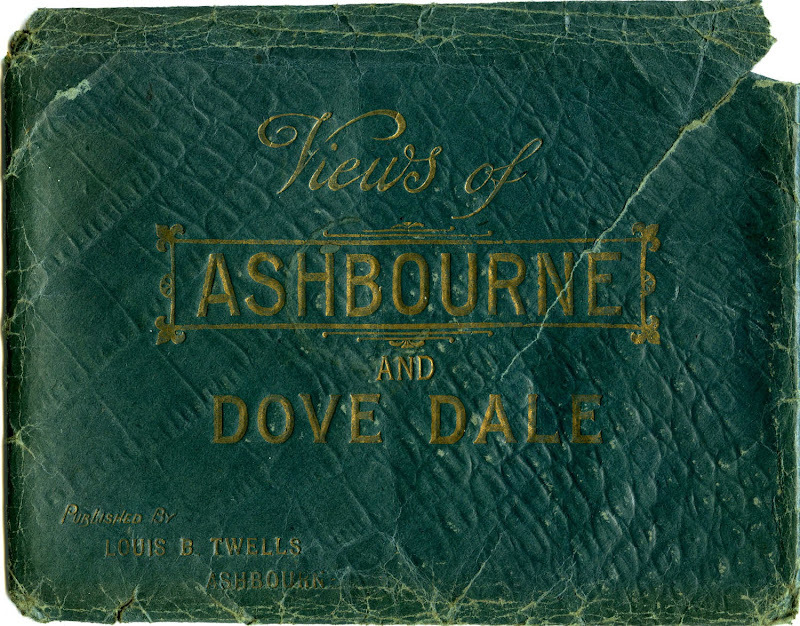 The title on the envelope simply states, "Views of Ashbourne and Dove Dale" - which indeed they are - published by Louis B. Twells of Ashbourne. Louis Bosworth Twells (1829-1885) settled in Ashbourne (Derbyshire) around 1855, and over the next three decades conducted a variety of trades: hair cutter/dresser, perfumer, jeweller, silversmith, watch maker, importer of general fancy goods, sponges, &c., and proprietor of "large show rooms for glass, china, and earthenware." I have seen a single example of a carte de visite portrait which he also "published." There is no direct evidence that he took any photographs himself, but he may well have done. After his death in 1885 his widow and son, also named Louis B. Twells, continued to operate the business until 1903. Original photograph publ. by James Valentine & Co. 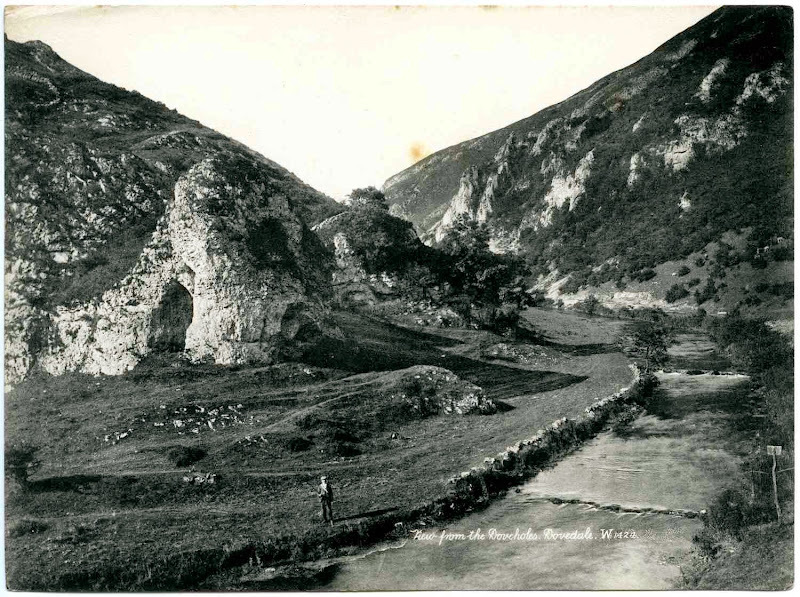 This view of Dovedale from the mouth of the limestone cave known as Dove Holes is one of 16 prints of excellent quality which don't carry the name of either photographer or publisher. A detailed examination of the prints reveals artefacts suggesting that they were reproduced from carefully retouched photographic prints. in the characteristic cursive script used by famous postcard publisher James Valentine & Co. of Dundee. However, I've yet to find an example of the original photograph published by Valentine. A second group of 16 prints show similar landscapes. Although of slightly poorer reproduction quality, these views are still very professionally composed, and are annotated with the initials "G.W.W." This indicates that they were originally published by George Washington Wilson & Co. of Aberdeen, another Scottish photographer who became one of the largest publishers of photographic prints in the world, rivalling the business of Valentine and Sons. The University of Aberdeen Library has an enormous collection of 45,000 of George Washington Wilson's glass plate negatives, the original photographs taken between 1853 and 1908, with digitized images online. There are 488 views of Derbyshire alone and the web site is well worth a visit. I wasn't able to find the same view, but I did find a similar one, with a negative number (3923) suggesting that it was probably taken on the same occasion. The remaining views from the Ashbourne & Dovedale collection can be seen in this slideshow created with Picasa. It's difficult to know now if all 32 of the prints were originally sold in this wallet, or whether the G.W. Wilson prints were added later by a previous owner. However, from what I can tell, they appear to have been taken over roughly a decade from the mid-1880s through to the mid-1890s. Photographs mounted on glossy card of the particular shade of dark green used for the envelope were very popular in the 1890s, and I suspect that Louis Twells Junior was selling this collection at this time. My other purchase was a small group of lantern slides, almost certainly taken by an amateur, two of which depict an outdoor excursion by a small group of young men and women. Although not annotated, the view above is identifiable as the River Dove in the vicinity of Twelve Apostles' Rock, also shown in one of the prints by G.W. Wilson in the slideshow above. 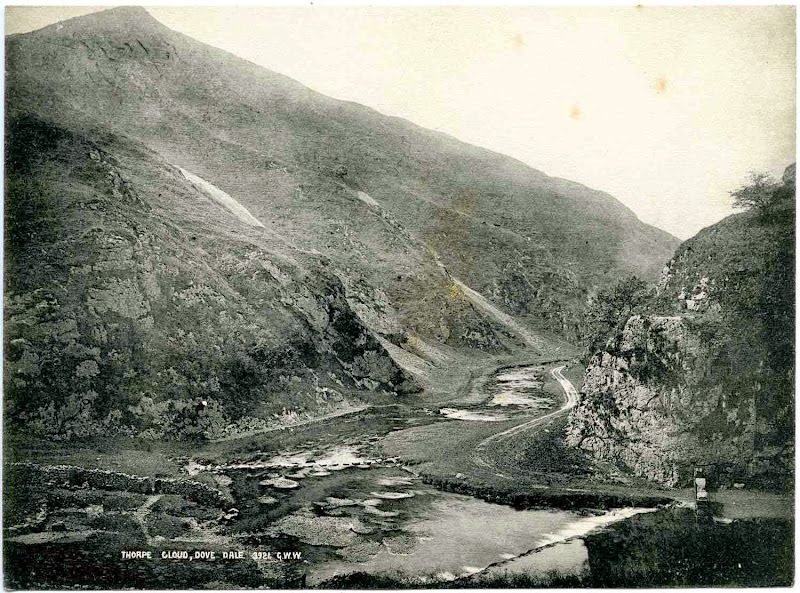 A second image shows three men and four women seated on a hillside, judging by the nature of the scree, probably the lower slopes of Thorpe Cloud or one of the adjacent hills flanking the entrance to Dovedale. If, as seems likely, the group consisted of four young couples, a fourth man is probably taking the photograph. One of the other slides in this small collection is dated 1906, and the clothing fashions of the women in the photo suggest that these are from a similar time period. The second half of the nineteenth century saw a huge expansion in the number of people taking trips to the seaside and day excursions into the country. Pictorial mementos available to the everyday tourist included scenic images in the form of stereoscopic cards, carte de visites and unmounted prints published by both local firms and by larger enterprises such as Valentines and G.W. Wilson. During the 1890s and early twentieth century advances in camera design and technology made them considerably cheaper and more portable. As a result, excursionists were able to create their own mementos as they enjoyed their holiday. These lantern slides were most likely produced by direct printing on thin glass slides from original glass-plate negatives, and would have been displayed with a magic lantern projector similar to that shown above. Postcard Publishers, Printers, and Distributors of Note by the Metropolitan Postcard Club of New York City. The George Washington Wilson and Co. Photographic Collection, University of Aberdeen Photographic Archive. George Washington Wilson Collection online. It's not often that a Sepia Saturday image prompt gives me the opportunity to include a profile of a Victorian Derbyshire photographer, and it seems unlikely that this week's photograph of a horse rider in the Australian bush should do so. Thanks to sharp-spotted fellow photohistorian Marcel Safier, I am able to present a Derbyshire photographer who emigrated to Australia, and spent most of his life in a remote town on the coast of Victoria. William Snowdall Anderson was born in 1867 in Surfleet, a small village in rural south Lincolnshire (coincidentally only a couple of miles from the village of Pinchbeck, a name which featured in an article here last week). He was the third child of a wandering blacksmith; by his early teens the family had lived in at least five different villages. Little is known of his early career as a photographer except that by late 1886, when the 1887 edition of Kelly's trade directory was published, and by which time he was not yet 20 years old, he had opened a photographic studio in Granby Street, Ilkeston, Derbyshire. Adamson shows him operational at this address for at least a year until 1888. In November 1889 Anderson emigrated to Australia on the steamship Port Caroline, arriving in Victoria in early 1890, and was married to Bertha Wardle later that year. He worked as a photographer, initially with a studio in South Yarra, later touring Victoria as an itinerant photographer in a mobile caravan. In December 1898 he purchased a photographic business from J.S. Norman and J.W. Brown in the township of Lorne on the coast south-west of Melbourne. Down the road to Lorne. Judging by the number of similar photographs of Mountjoy's coach full of passengers crossing a bridge over the Erskine River, complete with characteristic Eucalyptus-clad backdrop, in the collection of Museum Victoria, these customers must have formed a significant part of Anderson's business. Over time, however, his output varied considerably, picturing both the beauty of the landscape surrounding Lorne and the lifestyle and character of its inhabitants and visitors. The same view today is different, naturally, but still recognisable. From 1898 until his death in 1948 Anderson photographed the changing surrounding landscapes and visitors of guest houses in the area. His practice also included panoramic photography, stereoscopic photography, portraiture and experiments with trick photography. William S. Anderson died at Ormond, Victoria on 2 July 1948, aged 80, leaving four children and a legacy of five decades' worth of photographs, many of which survive in the State Library of Victoria, Museum Victoria and, no doubt, tucked away in innumerable family archives. The Sepia Saturday image prompt this week shows a cased daguerreotype of a young Texan woman, judging by the clothing and hairstyle probably taken in the 1850s or early 1860s. My contribution is not a daguerreotype, or the superficially similar and slightly later ambrotype, but it does have a superficial resemblance to both formats. This tiny gem tintype (aka ferrotype) is mounted within a gold-coloured foil or pinchbeck preserver (aka matte), which is then attached with two small lugs to a carte de visite mount (58 x 97mm), itself pre-printed with an ornate oval frame. It was one of 47 cartes de visites in an album which I purchased a few years ago, portraits from New York, Michigan, Wisconsin, Ontario and Darlington (England). The pinchbeck preserver appears to be an imitation of those used for cased daguerreotypes and ambrotypes prevalent in the 1840s and 1850s, and still present in the 1860s, along with the carte de visite. These foil-edged, card-mounted gem tintypes are not uncommon, but the subject of this diminutive image is rather nice - a clear image of a young woman with spectacles, ringlets and slightly rouged cheeks. Her hair is combed flat with a central parting and hangs in ringlets, almost entirely covering her ears, the fashion suggesting it may have been taken in the early to mid-1860s. The preserver measures 19.5 x 26mm, implying that the tintype is the standard ¾" x 1" gem format, although the oval-shaped portion of it visible is only 15.5 x 21mm. Over 81 Main Street, Rochester, N.Y. This deceptively simple fragment of print provides a clue to the origin of the gem tintype format, which was to survive for many decades and undergo several reincarnations. George W. Godfrey was a moderately successful photographer who operated the Sunbeam Studio in East Main Street, Rochester from the early 1860s until his death around 1889, but it is the name Wing which resonates. In the words of renowned photographic researcher and collector Mike Kessler, "after Simon Wing, photography was never quite the same." The tintype was invented in France in 1853 and became enormously popular in a very short space of time in the United States, being cheap and simple to produce. In the late 1840s and early to mid-1850s, Albert S. Southworth of Boston and others had designed and patented a number of daguerreotype cameras which, using a combination of several lenses and a moving plateholder back, could produce multiple images on a single photographic plate. Simon Wing of Waterville, Maine and Marcus Ormsby of Boston purchased Southworth's patents and applied the technology to the then new wet collodion process used to produce ambrotypes and tintypes. In June 1862 Wing patented his own "multiplying camera" to take up to 72 tiny images on a thin metal plate, which were then cut up into separate "gems," thus reducing the cost per portrait considerably. The gem portraits could be mounted behind preservers on cartes de visite, also designed by Wing, making them seem larger than they actually were, and in a style somewhat reminiscent of cased daguerreotypes and ambrotypes. A popular alternative was to insert them into slots in a miniature album designed specifically for the format. The gem tintype album of Henry Hersey Hinckley Jr. (b. 1853) of Massachusetts, shown above (from the author's collection), includes portraits taken as early as c.1861-1862, although the compilation may have taken place at a later date. Wing and other manufacturers made many versions of the "Gem" wet-plate cameras. Some, such as the one pictured above by an unknown U.S. maker, could be converted into a four-lens arrangement for taking carte-de-visite-sized portraits. Several similarly mounted gem tintype portraits from the Sunbeam Gallery have been found on the web, with a variety of printed frames demonstrating that Godfrey used this particular format for some time. Similar to the manner in which Beard and Talbot had managed their rights to the daguerreotype and calotype patents in the United Kingdom, Wing sold cameras, photographic materials and "franchise" licences to a large network of studio operators, and assiduously pursued through the courts those whom he regarded as infringing his patents. By E. Parker's Gallery, opposite Village Hall, Brockport, N.Y. When a photographer bought a Wing camera, he also bought a territory for a number of miles around. No other Wing cameras would be sold in the area for as long as the purchaser remained in business. If the photographer couldn't afford to buy the package outright, Simon would set him up with a pay-as-you-go program, with a percentage of the profits to be returned to the company until the debt was paid off. This gem tintype in a very similar style was produced at roughly the same time at "Maynard & Nelson's Picture Gallery, over the P.O. Milford," almost certainly with one of Wing's competitors' cameras, and most likely a target for the never-ending series of prosecutions. By mid- to late 1864, Godfrey was already trying out alternative, simpler methods of mounting the gem tintypes, even though they were still being taken with his Wing camera. This example of a Union soldier's portrait in uniform at the Sunbeam Gallery in Rochester is mounted cartouche-style behind, rather than on top of, an embossed card. It is particularly useful because the subject has been identified from a pencilled annotation, and a revenue stamp is affixed of the back, thus making it possible to infer a fairly accurate date. Malone enlisted at Rochester on 4 September 1863 and was killed at Blicks Station, Virginia on 19 August 1864. The blue revenue stamp, cancelled with a single stroke with a black pen, signified that a 2c Civil War federal tax, imposed on photographs costing 25c or less from 30 June 1864 until 1 August 1866, had been paid. While the portrait was most likely taken between the time of his enlistment and his company's deployment to Virginia in late April 1864 (Phisterer, 1912), it must only have been mounted after the tax had come into effect (Harrell-Sesniak, 2012). George Godfrey continued to produce tintypes from the Sunbeam Gallery for a few years, although embossed and printed cartouche-style card mounts appear to have rapidly replaced those attached with foil preservers. The portraits of President Abraham Lincoln and his wife Mary Todd Lincoln shown above are typical examples and were probably produced in large quantities in 1865 after Lincoln's assassination. Although the popularity of gem tintypes started to decline somewhat after the end of the Civil War, they were still produced in significant numbers throughout the 1870s and 1880s, and remained the format of choice for many travelling photographers. Simon Wing's cameras remained fundamentally the same until the late 1880s, when he and his son Harvey introduced a number of new designs, including the Ajax Multiplying Camera (c.1900) and the Wing Prototype Multiplying Box Camera (above) patented in 1914. Although only two of Harvey Wing's prototypes were ever produced, it is remarkable that the inherent concepts of these multiplying cameras were revived once again for the Polyfoto camera twenty years later, which I wrote about here on Photo-Sleuth three weeks ago. I'm very grateful to The Spira Collection, Mike Kessler, Rob Niederman, Matthew R. Isenburg (via Marcel Safier), George Eastman House, Mike Rosebery, the Library of Congress, PhotoTree.com, Mike Medhurst and Cowan Auctions for the very useful scans of and information provided about items in their collections. By kind courtesy of the author, the late Mike Kessler, I am now able to offer you a PDF of the Summer/Fall 1994 issue of the Photographist containing the excellent article about Simon Wing as a direct download (click on the image above). Many thanks to Rob Niederman for facilitating this. It's an important resource to have available online. Anon (1870) Who Infringe the Sliding Box Patent, The Philadelphia Photographer, Vol. VII, p. 45-46, courtesy of Archive.org. Phisterer, Frederick (1912) 14th Artillery Regiment, Civil War, in New York in the War of the Rebellion, 3rd ed., Albany: J. B. Lyon Company, courtesy of the New York State Military Museum and Veterans Research Center, NYS Division of Military and Naval Affairs (2008). Griffiths, Alan (nd) Revenue stamps during the American Civil War, on Luminous Lint. H., Christine (2012) Civil War Revenue Stamps, on The Daily Postcxard, 19 October 2012. Harrell-Sesniak, Mary (2012) Dating Old Family Photographs with Civil War Revenue Stamps, on Genealogy Tips from GenealogyBank, 14 November 2012. Kessler, Mike (1994) After Simon Wing Photography Was Never Quite the Same, in The Photographist (Journal of the Western Photographic Collectors Association), No 102 (Summer 1994), p.6-47. The Sepia Saturday image prompt this week reminded me of maritime uniforms, even though it was taken in quite a different setting, and I'll take the opportunity to use some images relating to this theme from my own family collection. You're welcome to start the music below to get you in the mood with an appropriate soundtrack, and then read on. We all have those relatives who appear in family albums, but about whom we know very little, and my great-uncle Willem Hendrik Schipper is one of those. Surviving genealogical records are mainly centred around an individual's birth, marriage and death. Census enumerations, which add to the basics in generating a basic framework of family history research in the United Kingdom, Canada and the United States, have not been kept in the the Netherlands. As a result, all I have to anchor the dates of a biographical history for Willem, since never married or had any children, are his birth in 1882 at The Hague and his death at sea in 1932, somewhere between Sierra Leone and Amsterdam. There are a few documents and items of ephemera which fill in some of the gaps, such as a "Testimonial of Attendance" for Willem at the Ambachtschoool te 's-Gravenhage, dated 1 July 1899, and a funeral notice in the form of a newspaper clipping. However, what we do have are plenty of photographs, both loose and in a loose-leaved album compiled by his younger sister (my great-aunt Gien) in the 1920s and 1930s. Using these, I have been able to piece together more of a story. My grandmother and her three older siblings grew up in The Hague, where their father Jan Schipper (1857-1921) worked as secretary to the Director of Queen Wilhelmina's Cabinet at The Binnenhof. According to my mother (who presumably learned it from her mother, since Willem died when she was only eighteen months old), Jan Schipper became very embittered after a disagreement with his new boss, perhaps also from being passed over for promotion, which reflected on his behaviour at home and made life very unpleasant for his wife and children. Willem and his younger brother Harry both 'escaped' from this odious atmosphere by joining the merchant navy at a fairly young age. Willem Schipper joined Koninklijke Hollandsche Lloyd as an engineer in 1909, where his "zeal and devotion to duty earned him quick promotion." He appears to have spent most of his early service in the Dutch East Indies at a time when the Empire was reaching its maximum extent. The photograph above shows him in front of a lifeboat on an unknown ship, with what I believe is the rank of 2nd Engineer. Life in the tropics was not all work and no play, as is amply demonstrated by this studio portrait of Willem relaxing with two friends or colleagues in Weltevreden, the suburb of Batavia (then capital of the Dutch East Indies, now Jakarta) which housed the Dutch administrative headquarters. The cigarette in his right hand is indicative of what would becopme a life-long habit - rarely does Willem appear in photographs without a cigarette or pipe. This series of silent film clips which I found on YouTube were probably taken from a moving motor vehicle, which must have been one of the few in Batavia at that time. It gives a very good feel fpor the ambience of the colonial suburbs and busy merchant quarters, complete with wagons, carriages, rickshaws and trams. Another YouTube film of 1920s life in Java includes a clip showing the arrival of a ship at the wharf, together with crowds of colonial men in their whites and solar topees. Willem must also have found time for some leisure travel, as demonstrated by this mosaic of a sugar factory at Soemberhardjo in central Java pasted into his sister's album. The factory was built in 1912, thus providing an earliest date for the photograph, and is apparently still operating, complete with geriatric steam locomotives used for hauling the sugar cane. There are several photographs in the album taken on board the SS Gelria, a passenger steamer in service with KHL from May 1913 to March 1916 and again from 1919 to 1931, and it seems likely that Willem served on this ship during the earlier period. The Netherlands retained neutrality during the Great War and their ships continued to operate. The image above shows Willem (seated at left) apparently being congratulated on his promotion to Senior 2nd Engineer by Kapitein Brunt, Junior 2nd Engineer Visser and 1st Marconist (wireless operator) Vuyck. Another group portrait on the Gelria shows him with junior officers, each with only one stripe on their epaulettes, seated on and standing around cane and wicker furniture in a more formal arrangement. En route from Amsterdam to the East Indies the ships often paused off the coast of West Africa. Willem and his colleagues took advantage of the opportunity to barter for curios with the locals who paddled out to the ship at anchor in the port of Calabar in Nigeria. The steamship Prins der Nederlanden was a passenger ship of the SMN line (Stoomvaart Maatschappij Nederland/Netherlands Steamship Co.) which operated between 1914 and 1935, so I must presume that Willem was a guest on board when this group photo was taken. After some years in the East Indies, illness forced a return to the Netherlands, but he was quickly offered a position on the Royal Dutch Lloyd ship SS Gaasterland. On this and other ships, perhaps including the SS Zeelandia (above), he spent at least a decade plying the trade routes of the North and South Atlantic, calling in at ports on the coasts of several continents. I found several crew lists from the SS Gaasterland arriving in New York in 1920 and 1921 but, juding from number of photographs from South America in the album, supplemented by a postcard sent to his recently widowed mother from Buenos Aires in July 1921, most of his trips headed further south. The print above shows timber and other goods being loaded from a wharf onto a cargo ship (or possibly unloaded) which unfortunately has part of its name clipped, leaving only "...LAND ...ERDAM" visible at the stern. Some of his journeys ventured a little further afield almost into the Pacific, visiting the western coast of Chile via the Patagonian Channels. This ship also appears to be carrying a cargo of timber on the deck. In a rare shot, Willem appears in his working clothes with two colleagues, apparently engaged in some real work (or at least supervising it), the now ever present pipe clasped firmly in his right hand. Another shows a group of people repairing a winch aboard the SS Rijnland. Criss-crossing the Atlantic regularly allowed them to stop off periodically in Funchal, the capital town of the Portuguese island of Madeira, where they stayed at the Grand Hotel Belmonte, strolled through the municipal gardens, wandered the narrow cobbled alleys, and caught a ride from Monte down the steep streets on mountain basket sledges, which still catch the unwary tourist today. In late 1931, while on a voyage of the coast of West Africa, Willem became very ill and he wrote to his sister and brother-in-law just before Christmas that he had seen doctors in Grand Bassam (Cote D'Ivoire) and Freetown (Sierra Leone), who diagnosed heart problems. He rested for a short while at the Grand Hotel in Freetown, but died on board ship somewhere between Sierra Leone and Amsterdam on 12 February 1932. A letter to his mother from an Evangelical Lutheran Missionary who travelled with him off the West African coast makes it clear that he "felt that he would not live long." I inherited this rather battered and well used silver ashtray from my Dutch grandparents some years ago, and even used it for a while until I gave up smoking. I always thought that the engraving had a somewhat oriental look to it, but it wasn't until recently, when I started examining the photographs in Aunt Gien's album in greater detail, that I realised that it may well have been picked up by Willem in Dutch colonial Batavia. The maker's marks on the base don't mean much to me, but perhaps a knowledgeable reader will recognise them and enlighten me. I'm not sure that I feel quite the same way about it, now that I know it may have been so closely associated with Willem's heart disease, and therefore his death.